We are Platinum & Palladium Buyers. 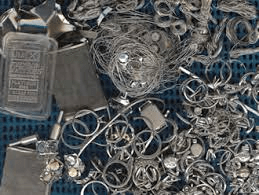 Sell Platinum and Palladium from Jewellery to Scrap Industrial We buy all types of Platinum and Palladium from jewellery items, labware and industrial grain, flakes, powder, and general bits of scrap. If you have the odd item of Platinum or palladium jewellery you can obtain a sell price for your items by using our gold and precious metals price calculator. We are particularly interested in buying Platinum and Palladium rings, bangles, bracelets and chains etc. If you have scrap waste material of platinum or palladium please telephone Lionel on 0121 448 0488 to discuss your options. Platinum and Palladium are more difficult and costly to refine than either gold or silver. They both have a very high melting temperature making it difficult to melt cleanly. By keeping our costs as low as possible and with leading expertise in the field of processing both platinum and palladium waste on a smaller scale than the really big guys (who do not deal with the Public) we can offer you the best prices for your scrap platinum waste. In most cases we can agree a purity and a price over the counter and pay you out straight away.